City crews spent most of Friday, Jan. 15 and Monday, Jan. 18 repairing a water main break in front of the Blue Marlin Inn on Johnston Road. City crews spent most of Friday and Monday repairing a water main break in front of the Blue Marlin Inn on Johnston Road. “It started around 9 a.m. [Friday] and we could see it on our SCADA computer but we didn’t know where it was yet,” said waterworks chargehand Amar Giri. Crews got to work just before 10 a.m. on Friday, digging down five feet to the 14-inch asbestos cement pipe. They first attempted to install a clamp over the leak but were unsuccessful and applied a temporary fix over the weekend before going back to work Monday. 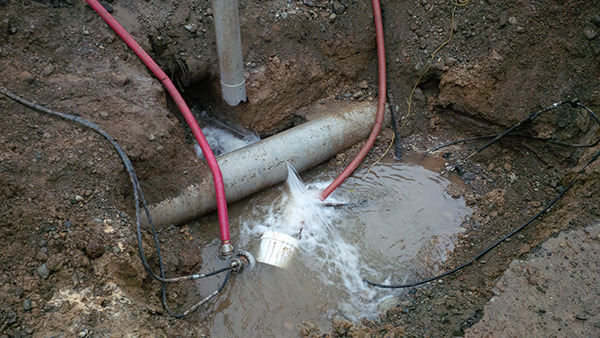 “The clamp didn’t work on Friday and we discovered that another repair had been done close [to the leak]. We decided to cut a piece of C900 plastic pipe in,” said Giri. Six metres of pipe was replaced.